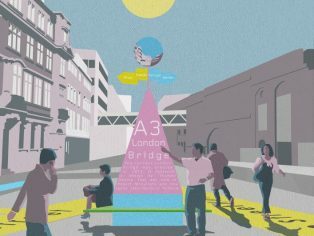 Charles Holland Architects have won a design competition – organised by the London Festival of Architecture (LFA) and Team London Bridge – to improve wayfinding and the public realm outside London Bridge station. The competition was open to architects, designers and artists, who were invited to produce design concepts for the transformation of the Tooley Street Triangle – a busy but dull traffic island opposite the main entrance to London Bridge station. 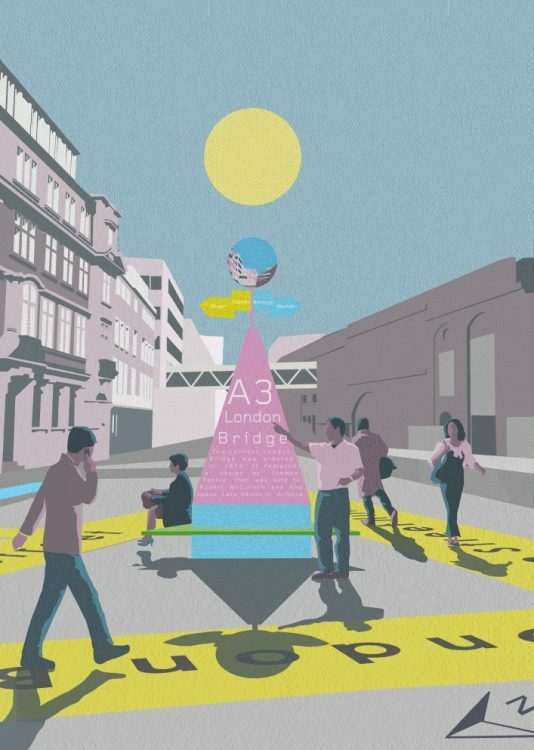 You Are Here is conceived as a page of the London A-Z come to life, helping the thousands of people using London Bridge every day to find their way around the area, and transforming the overlooked piece of pavement into a local landmark and meeting point. It has two parts: a scale map of the area around London Bridge printed onto the pavement, complete with street names and major landmarks, and a giant signpost with local directions and information on it. The triangular beacon is intended as a visual symbol for the Tooley Street Triangle and also has a bench to allow passers-by to take a breather. The location draws people from the busier main roads and signposts quieter routes with cleaner air, away from noise and pollution. Charles Holland Architects is an international architecture and design studio whose work includes buildings, exhibitions, public art, urban design, teaching and research. Charles Holland was previously a director of FAT where key projects included A House for Essex in collaboration with Grayson Perry. Current projects include houses in the UK and Holland, the regeneration of a historic high street and public artworks in Kent. The practice was successful in the competition which attracted 36 entries, and was judged by a panel including Jonas Lencer (director, dRMM), Jack Skillen (placeshaping director, Team London Bridge), Tamsie Thomson (director, London Festival of Architecture) and Matthew Hill (head of highways, Southwark Council).